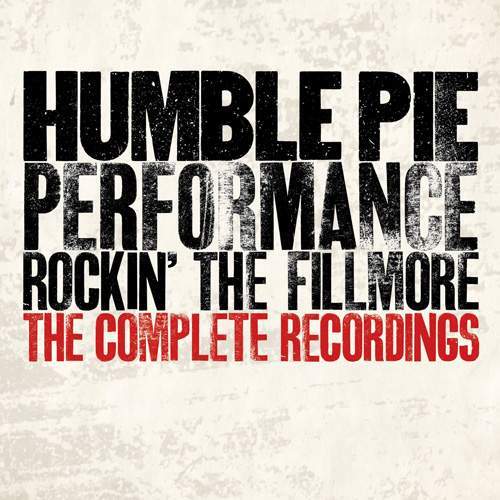 There’s not a lot of live tapes in the HUMBLE PIE released canon, and only one of them, 1971’s “Performance – Rockin’ The Fillmore”, was released during the band’s lifetime and considered classic. The quartet weren’t as heavy as they’d become when Peter Frampton was replaced with Clem Clempson but the group’s on-stage swing felt immense even then – and will be felt anew this October, when the classic album’s expanded version, “Performance – Rockin’ The Fillmore: The Complete Recordings,” will see the light of day. Out on 4 CDs, it’s to include all four complete shows that PIE played at the glorified NYC venue on May 28th and 29th, 1971 from which the original LP had been culled. Newly remastered, and produced by he band’s surviving members, singing guitarist Peter Frampton and drummer Jerry Shirley – sadly, the other singing guitarist Steve Marriott tragically died in 1991 and bassist Greg Ridley passed away in 2003 – the set is a fantastic document of an era long gone.